It may just be a preseason game this Thursday, but a matchup involving the two teams who just faced off in last year's Super Bowl — the Eagles beat the Patriots 41-33, in case anyone forgot — will always have a little extra juice. So this week will feature plenty of trash talk directed in Tom Brady's direction, a whole lot of reflection on Philadelphia's historic win, and if Eagles fans get their wish, another victory over Brady and Co. on Thursday. In the meantime, we have some time to kill. Let's take a look around the Eagles and the NFL at large. 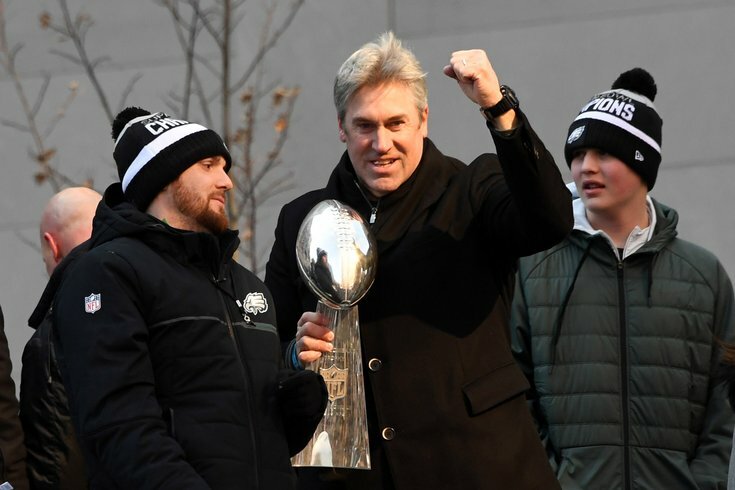 I have a feeling the lede of this story is going to rile a few people up, but if you can get past the dismissal of Philadelphia's cultural stature, it is quite refreshing to see Pederson's stature grow nationwide. After being subjected to plenty of criticism after an up-and-down first year — including from the very website Baumann writes for — Pederson's status is in no doubt, here or elsewhere. Pederson led the 2017 Eagles to a 10-1 start and a 13-3 record—and a relatively easy 13-3 record, all things considered. Philadelphia’s three losses came by a combined 27 points, and counting their 38-7 NFC title game demolition of Minnesota, the Eagles won five individual games by 27 points or more. Pederson’s Eagles finished fourth in scoring defense and, despite losing Wentz for the year in a Week 14 win over the Rams, they finished third in scoring offense. As Wentz matured into a franchise quarterback, Pederson became one of the game’s most aggressive coaches. The Eagles jumped to eighth in third-down conversion percentage in 2017. They went for it on fourth down 26 times, second-most in the NFL, and converted 17 of those chances for the third-best percentage in the league. They also led the league with nine two-point conversion attempts. Mailata had the worst possible beginning to his NFL career outside of injury, giving up a sack and a fumble on the first pass protection he was asked to make. But he bounced back in his first preseason game, albeit against a level of competition well below what he'd see in a regular season game. Still, there's plenty of promise when you see a guy that big and athletic lined up at tackle. It’s safe to say the secret is out on Mailata after the job he did in the Eagles’ preseason opener, his first football game ever. Playing left tackle, Mailata was beaten for a strip-sack on his first pass protection assignment by undrafted rookie Olasunkanmi Adeniyi of the Pittsburgh Steelers. That was the only sack Mailata surrendered largely because he used his strength and length to wear down the rush. There were occasions when Adeniyi just pushed away from Mailata, rather than rush. Mailata enjoyed that almost as much as drawing a false start penalty from the Steelers. Mailata is the pet project of Eagles offensive line coach Jeff Stoutland. The big guy wouldn’t have been drafted had Stoutland not seen enough special qualities during a private workout. The process began when Eagles assistant scouting director Brandon Brown was at Mailata’s pro day in Tampa. Jeffery cemented his legacy in Philadelphia with massive contributions during the Eagles' Super Bowl run, but there remain some doubters that he can be "the man" in Eagles green. That whole notion is a bit silly, to be frank — the offense under Doug Pederson has shown not to be reliant on any one player either way. If there's a place he's going to make his money, though, it's without a doubt going to be in the red zone. Jeffery’s debut season with the Eagles went as best as it could, catching 69 passes for 1,008 yards and a team-high 12 touchdowns en route to a Super Bowl win. And he did so by making his presence felt in the red zone. The 6-foot-3, 218-pound South Carolina product caught nine of his 11 catchable red-zone targets for 73 yards and eight touchdowns, the latter metric finishing second only to current Cleveland Browns wide receiver Jarvis Landry. Jeffery also caught 4-of-9 contested red-zone targets for three of his eight touchdowns. Now the key is just getting him back on the field healthy, which could be slightly more difficult than the Eagles would like. In what is quickly becoming a common theme this preseason, Shiel's lead point here concerns the path for Donnel Pumphrey to make the Eagles' 53-man roster. Which is to say, it's going to be an uphill climb for the injured back to stay in the competition. This is the second straight year the diminutive back has dealt with health concerns, and there's not exactly a lack of competition at the position this summer. From the sound of things, it doesn't look or sound good for the 2017 draftee. It seems like Donnel Pumphrey suffered a “lower body” injury at the worst possible time. “Obviously it’s hard. It’s an injury. Any time it’s a lower body [injury], it takes time and we just got to make sure he’s 100 percent,” Doug Pederson said. “…It’s hard for young players, quite honestly in this league, to make rosters. If you're looking for a guy who's going to talk about the supposed "upside" of Hackenberg, it is certainly not going to be me (or a lot of the beat writers covering the team, for that matter). But whenever a new QB enters the mix, it generates a bit more discussion than any of the other backup positions, for obvious reasons. And while we'll have to wait and see if there's anything worth salvaging here, at the very least Hackenberg is saying the right things out of the chute. Sitting on the couch is exactly what Hackenberg has been doing in the last two months. He said he worked with personal trainer Jeff Christensen and did 86 two-a-days of workouts trying to perfect his arm motion and footwork. He said this summer was the first time since he could remember that he was not involved in a Training Camp in some form. Hollins was not a huge contributor on offense last year, but the plays he did make were often big and spectacular, same as they were during his time at UNC. It's stringing more of those together and becoming a consistent threat that will make or break where his career goes from here. The special teams ace doesn't sound content being a bit player for the reigning Super Bowl champs. That's a good thing. “We have high hopes for Mack,’’ said first-year offensive coordinator Mike Groh, who coached the Eagles’ wideouts last year. “He was certainly a big part of what we did last year. Hollins, who walked on at North Carolina, didn’t seem to be fazed by much during his inaugural NFL season. But he said he has a much better grasp of Doug Pederson’s offense and what’s expected of him the second time around. “The biggest difference for me is just knowing the playbook and having a better understanding of how things work and how coach Pederson wants things done,’’ he said. “How practice rolls. Can Panthers follow the Eagles' blueprint? Straying from the beaten path a little bit, I thought this was an interesting approach to take for another NFC team's website, and certainly a new phenomenon for the Eagles and their fans to deal with. Rather than spending the offseason with regrets and wondering who they can mimic to climb to the summit, it's Philadelphia setting an example for other teams around the league. Who better to send that message than Torrey Smith, who was part of that Eagles ensemble last season? That’s not the typical rah-rah stuff you hear this time of year. Smith's point, though? The Eagles totaled just three 100-yard receiving games last year. Beauty is in the eye of the beholder, but this one's going to be a no from me, dawg.